Sugarcane Juice leads To Weight Gain - Is It True? 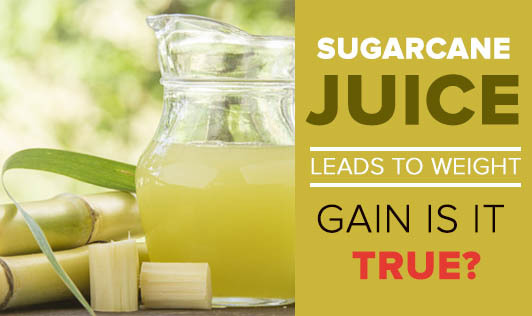 We know that sugarcane juice is a sweet liquid derived from the stalks of sugarcane. This is a common beverage that is mostly produced in Asia, Brazil and South America. Looking into some nutritional facts, we can get an idea of whether sugarcane juice leads to weight gain or not. Calories - Sugarcane juice contains 84calories for 100ml with 100% of the calories from carbohydrates. Proteins and Fats- They are not found in sugarcane juice. Vitamins and Minerals -There is no significant amount of them present in it. Sugarcane juice is a good source of anti oxidants like phenols and flavanoids that protects one from lifestyle diseases like cancer, cardiac disease, etc. Though it is made purely of sugar, it is comprised of the right sugar, that is unrefined sugar. Also, a glass of sugarcane juice consumed daily does not necessarily lead to weight gain as this can cut down sweet cravings for unhealthy foods like carbonated beverages, sweets etc.However, sugarcane juice may need to be avoided by some people like those suffering from diabetes. You can spice up your sugarcane juice with lemon and ginger to make it a delectable health beverage this summer!